Commiphora myrrha tree, ane o the primary trees frae which myrrh is harvestit. 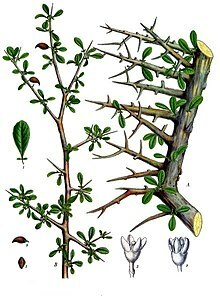 Myrrh frae the Ebreu '"מור"' ("mor") an Arabic مر (mur) is the aromatic resin o a nummer o smaw, thorny tree species o the genus Commiphora, which is an essential ile termed an oleoresin. Myrrh resin is a naitural gum. It haes been uised throuoot history as a perfume, incense an medicine. Myrrh mixed wi wine can an aa be ingestit. This page wis last eeditit on 25 Mairch 2017, at 18:14.